In the world of surface design the possibilities are endless — printing, photo, wax, silkscreen, stamping etc. My passion is working with silk, cotton, dyes and paints. Any method that will change the look of the fabric either commercial or ready to dye. Shobori is a good example of a dying art – the newer generations are not willing to learn the art from the masters plus the cost in Japan to weave their own silks has become to expensive and have been sent to China. 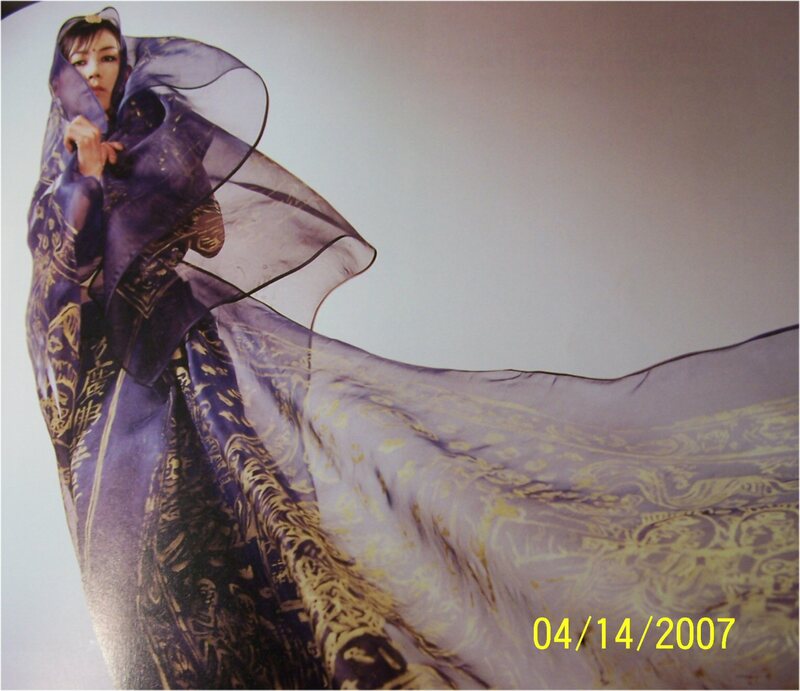 In the recent Surface Design Journal Jacqueline Ruyak did an article on Korean fiber artist Kihyang Lee – Dharma and Design and it features an elegant piece by Kihyang Lee called “Queen Maya of Motherhood” Hwa-eom Scripture in Gold Leaf on indigo organdy, traditional Indian sari style. It is part of Hwa’s Journey to Enlightenment, the 2003 “moving exhibition. If you have access to the Spring 07 journal it is on page 30 he work tells the story of Avatamsaka (Flower Ornament) Sutra, called Hwa-eom kyong in Korean. Untitled: Challenge from Jane Dunnewald-10 people received a two yard piece of silk dyed olive – we were ask to finish the piece. Do you do surface design? What is your preferred process? Use in art, quilting, wearable? Do you make your own stamps, silkscreen etc? I took my first surface design class with Cheri St Cyr in 1999. I came out with a pile of cloth I had no idea how to use. Some of it was, I thought, simply too ugly. Other’s I was too enamored of to cut into. It sat in a heap for years. Then one day in 2002 I was designing a piece to commemorate an incredible trip to the Black Hills. I needed a piece of fabric to use to represent the mammoths from the site in SW South Dakota. Voila! My best piece from the class came to mind, and it perfectly fit — bones! I then started digging through the heap to find several pieces that would work — even the ugliest. I often go into the wet studio to make a palette for a specific piece I have in mind. But sometimes I just go to play, to dab, to experiment. I love the process. I enjoy surface design, and use it both at the initial stages of cloth design, where I would make a particular piece of cloth from an idea, and at the end of the process, where I’ve used that cloth in a piece of work, and perhaps want to extend some of the marks into the larger piece. I don’t know that I’ve got a preferred process, I like ’em all, frankly. June, I have been known to keep a piece of cloth for a long time before finding a use for it. I recently used cloth I made about five years ago in a piece for exhibit in the US…I didn’t expect ever to be able to use it in a finished piece, I thought it was too individual, but these things happen. I’m really pleased with the result. I’m a great believer in serendipity. I make what I make, and I trust that I, or someone, will be able to use it at some point for something. Clairan and Susie, Gals after my own heart – the thermofax is a great treasure – I have had mine a little over a year and have made some great screens of pics we have taken on trips. I too enjoy making art cloth for its own sake — surface design on fabric. And to answer your questions Sandy, yes to all of the above — I am particularly enthralled to soy batik, dyepainting and printing with thermofax, on silk shantung and overdyeing old bark cloth. June, sometimes its enough just to make the fabric. To hang it over a rod in front of a window or against a wall, as if it were a painting. And I make a lot of small fabrics in demo-ing in classes I teach. Most of these pieces do end of in art quilts. I don’t ever buy fabrics with a use in mind, but work purely from improvisation once they are in my studio. I rarely buy anything other than thrift store and flea market cloth anyway (its part of my green practice). And yet, I think I use my fabrics with intent and not simply as decorative surface. Its just that the intent comes later in the selection, rather than in the making. Also, I tend to work with an intent in mind for the fabric itself — ie exploring a theme, a color, a textural potency, a emotional state an idea — for example, I have been making a series of “fertility cloths.” These all include symbols like pomegranates and fruit, rich colors and/or microphotography images of sperm, ovum, etc. I often go into my wet studio with just a “mood” or “atmosphere” in mind and work (well, play) with that. Everything can be used for something, and I really like to have a large “palette” when I’m starting to work on a piece. It’s not rude — I seem to have a drive to work on the fabric. I do some vendoring and plan to set up Ebay soon to sell some of the fabrics. 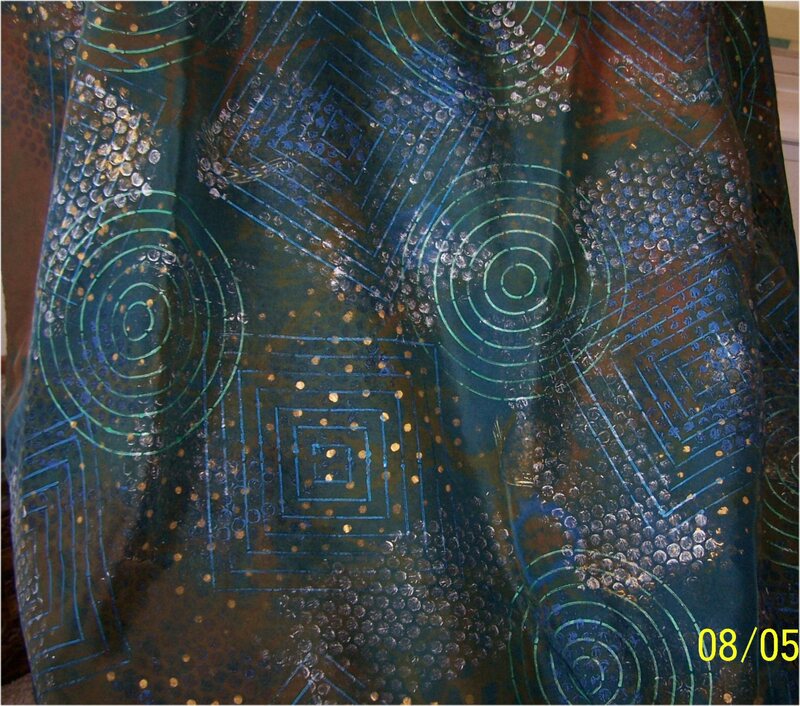 (I don’t buy a lot of commercial fabric just because I have so much of my own – just batiks and special exotic types). I also cut them and use them in the quilt work and garments. They make wonderful linings. I will work with a plan when needed for a special project but generally it is expermintal and just plain fun. I have a further question (with apologies for sounding rude): how can you design fabric, particularly now that almost everything you could want is available from surface designers, without knowing what it’s to be used for? I can sort of understand the commercial fabric lines, and I can understand buying the precisely right piece of fabric if you are making a quilt or a garment, but if you are spending hours and hours on the design, how can you do it if you don’t have a specific use or market? I started thinking about this because designing for clothing seems very different to me, particularly in one-of-a-kind fabrics, than designing for, say, quilts. But then as I got to thinking about it, I realized that as an artist who dabbles in fabric design, I never dye or mark fabric indiscriminately — I always have a specific use in mind. Doesn’t this kind of design simply feed into the overuse of decorative surfaces without a thought to, well, to thinking?